Rubber Fab's Torque Tee and universal socket are designed to aid in clamp installation and removal. 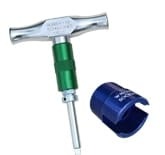 Available with a family of components, the Torque Tee handle creates effective tightening leverage and aids in reaching tight spaces, including over head and behind tanks. The universal socket is required when using the Torque Tee. Rubber Fab is pleased to offer the Torque Tee in Chrome Plated! Same great features and now with a chrome plated handle. Available in 30 in/lb and 50 in/lbs. Consult factory for other torques.